Nos. 32 (the pink house on the right) and 33 (the wider house on the left) date from about 1800, but were extensively rebuilt in the 1970s. They are each Grade II listed (List Entry Nos. 1369417 and 1068561). No. 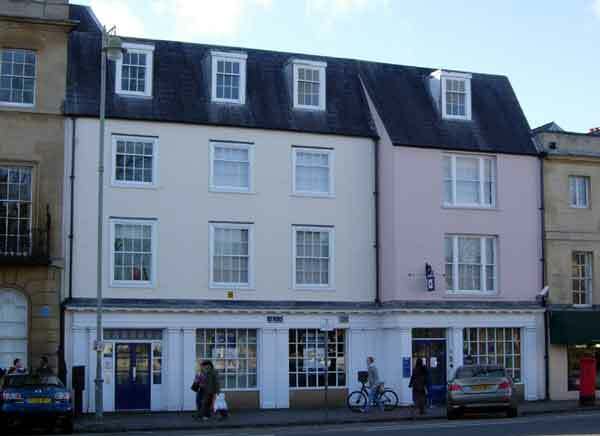 33 was occupied from 1831 to 1884 by the Bridgwater family, and beside it was a narrow passage widening out to Bridgwater’s Yard, which was occupied by three separate businesses. The left-hand section of No. 33 is first described as 33A in 1861, when it was let out separately from the rest of the house. No. 32 At the time of the 1841 census, No. 32 was occupied by the elderly maltster William Burrows and his two servants. In 1851 it was occupied by the baker & confectioner Charles Johnson, who lived over the shop with his wife and two young daughters, and a 14-year-old apprentice. In 1881 the building was occupied by another baker & confectioner, the widow Mrs Elizabeth Grace, and her daughter, her unmarried sister, two confectioner’s assistants, a young baker of 15, and their servant. No. 33 At the time of the 1841 and 1851 censuses, No. 33 was occupied by William Bridgwater, described in the latter census as a furniture broker employing two men and two porters; Gardner’s 1852 Directory also describes him as a Bath chair owner. He lived in the house with his wife Ann, his three daughters, and son William. He gave up the business at Michaelmas 1857, and John Bridgwater (probably his older brother) took it over, and can be seen here at the time of the 1861 census with his wife Sarah and son John. By 1881 John junior was an upholsterer & cabinet maker here, with his wife, four sons, two daughters, and a servant. No. 33A The 1861 census shows Thomas Newton, a dealer in china & glass, living at No. 33A with his wife and five young children.